What did Charlie play like before 1939? Is by many considered to be the «father» of the modern electric jazz guitar and although I always respected him for his contribution to jazz, I always felt his style to be a little too old fashioned for me, as I “grew up” with Kenny Burrell, Tal Farlow, Barney Kessel and their contemporaries. After acquiring a 1937 Gibson ES-150, out of admiration for René Thomas and Jimmy Raney, who both played the ES-150 during part of their careers, I became more interested in Charlie Christian. I completed a Retrospective Study of Charlie Christian’s Early Playing Style and Equipment. Here I try to describe what Charlie Christian must have sounded and what equipment he used before he joined the Benny Goodman Sextet. The article was published in the 18th anniversary issue of Just Jazz Guitar . (Nov. 2012). I like to thank co-author of A Biography of Charlie Christian, Jazz Guitar’s King of Swing Graig R. MicKinney for his kind suggestions and proofreading. Unfortunately we will never be able to determine exactly how Charlie sounded before his first recordings, as there is no recorded documentation of this period. There is much information avaible on the internet, so if you like to know more, you can visit a.o. : SOLO FLIGHT THE CHARLIE CHRISTIAN WEB SITE , or if you are interested in the guitars he played: Roots of the Electric Guitar. Charlie’s first electric guitar was a Gibson ES-150. 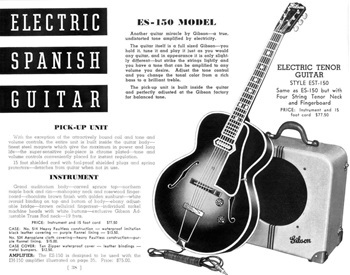 This guitar was first shown in the Gibson catalogue of 1937, in which year there were shipped 504 instruments, while it was introduced the year before (with production numbers containing a “B” as code for 1936). In a picture showing a picture is shown of Charlie saying goodbye to friend on a railway platform, most likely to depart for his tryout with the Goodman band, so this must have been 1939. On the platform I think I see the rounded corners of a Gibson EH-1850 (not the amp in the picture below). Since the amp’s slip cover is in place, other details are not visible.